When you own a house that is in need of continual repairs, simply owning it can become tiresome and frustrating. It may seem like you are making one repair after another, never really being caught up and always thinking about the next thing you will need to fix. Owning a house like this is expensive and incredibly stressful. Can You Sell a Home That Isn’t Up to Code? If your home has seen its fair share of handyman work or DIY home improvement projects over the years, chances are you have some hidden residential building code violations. Even if those problems were caused by a previous owner, you could be on the hook to fix them. 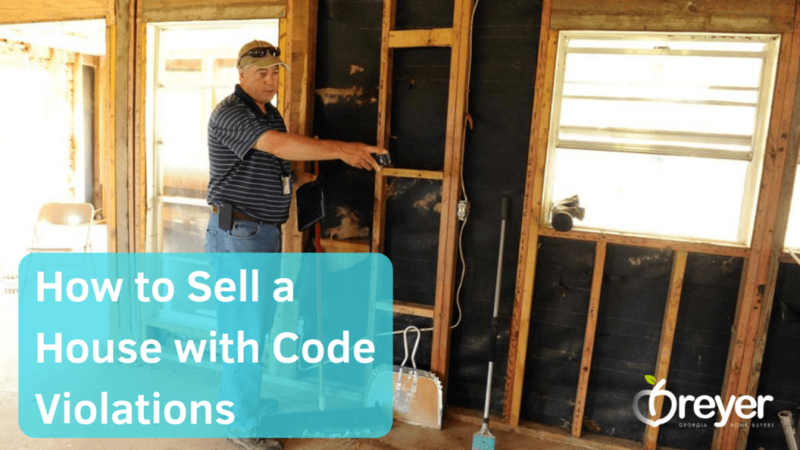 So yes, you can sell a house with code violations. Let’s cover four common building violations and how you can sell a house that’s not up to code. The most common mistake plaguing DIY bathroom remodels has nothing to do with plumbing or tile. It’s improper venting. Some homeowners don’t go the necessary distance to route air all the way outside. Instead, they just vent a bathroom fan directly into the attic. That’s a huge mistake. Pumping humid air into an enclosed space can promote the growth of mold, which can quickly lead to rotting wood. Left unchecked, it could cause major damage. Perhaps the most serious consequence of an improper ventilation setup is the potential accumulation of mold in attics or crawlspaces. The mold may appear as a fuzzy, thread-like, cobwebby fungus, although it can never be identified with certainty without being lab-tested. Inhaling mold spores can cause health problems in those with asthma or allergies, and can cause serious or fatal fungal infections in those with lung disease or compromised immune systems. Mold can really derail selling your house with a Realtor. Here’s an article on how to sell your house with mold. Almost any garage, basement or attic space can be converted into an extra bedroom, adding value to your home. But in order to be code compliant, that bedroom must have an egress window large enough for an adult to fit through. Many municipalities require a window with a minimum size of 20 inches wide and 24 inches high. If your window is too small, that could be a costly code violation. Wiring switches without a neutral wire. Installing the wrong cover on outdoor receptacles. Making an electric connection outside a junction box. Choosing the wrong kind of circuit breaker. Some of these problems aren’t difficult for a qualified electrician to fix. Others may require tearing out walls or even rewiring your house. Attaching the deck with nails (which can pull out) instead of using bolts. Lack of flashing, which can cause the wood behind the beam to rot. Notched or improper railing attachments, which can break. If you don’t have the time or money to fix any home inspection code violations, you can still sell your house. Real estate investors such as Breyer Home Buyers will buy the property as-is, whether it’s up to code or not. That way, you don’t have to go to the trouble of getting the proper permits, hiring a contractor, and spending a truckload of money trying to get your home up to code. Instead, you can sell your house without having to fix anything. Do you know how much it will cost you to bring your house up to par? Even with your best estimates, and help from professional contractors, you are very likely to go over budget. It is always safe to pad your renovation and repair budget by at least 20-30%. When you own a house that requires many repairs to make it livable, the costs can tend to snowball. Replacing a carpet can lead to the need to replace the flooring, which can lead to fixing a leaky pipe under the house and so on, and so on. Getting an accurate estimate can be tough! Before you dive into your repairs, make sure the value of the end product will be worth it! If you decide not to make repairs to the house, you can try to sell it as-is. There are two ways of doing this. You can either list it on the MLS with a local Atlanta agent or you can sell it outright to an investment company without any additional costs or repairs. Breyer Home Buyers is a team of homebuyers who will pay you an excellent price for your house no matter what condition it is in. Learn more before you decide what to do with your Atlanta house! Listing your house when it needs major repairs will take time and patience. Many people looking for houses in Atlanta will be turned off by the amount of work that is needed to make the house ready to move-in. The thought of making repairs and spending even more money after buying a home simply doesn’t sound appealing to many people. You will need to market the property to the right audience and make sure you are capturing all of the home’s potential in your ads. It is wise to enlist the help of a professional photographer in order to make your pictures stand out. People are very visual, if they see your listing with photos of a dilapidated house, they are likely to skip over it. However, great photos will help pique their interest, which will allow them to dive in a little deeper to see the home’s potential. A direct sale of your house when it is riddled with repair needs is often the fastest and simplest way to to go. At Breyer Home Buyers we purchase properties of all sizes, shapes, and conditions. We want to create a win-win situation so you can walk away from the property without facing any additional cost or stress. Keep in mind, not all buyers are the same. Some will ask for certain repairs be made or will make you wait while they find a buyer to assign the home to. This is not the case with us. We are ready to buy your house immediately and can typically close on the property in only a few short days. 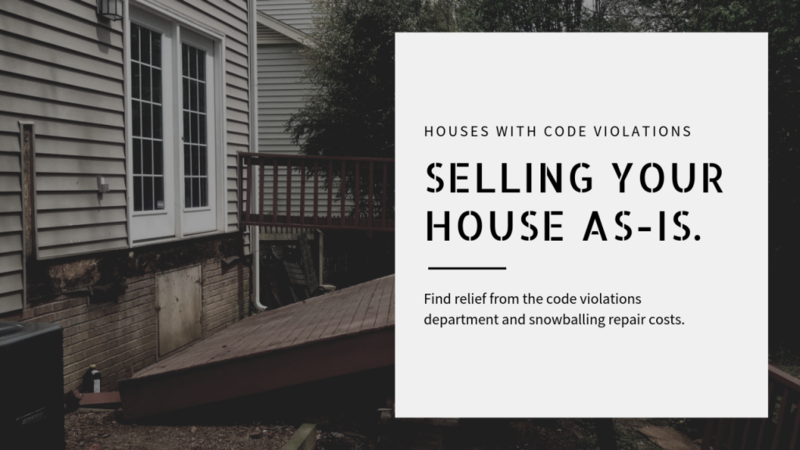 If you are looking for a fast and fair way to sell a house with code violations in Atlanta, get in touch with us today!